I love oven-roasted vegetables, but have always roasted root vegetables and winter squash. The night we ate at my son Aaron's apartment in Seattle, along with a spinach salad and sandwiches, he also served roasted green beans. They looked very weird—all shrivelled and shrunken, but they tasted fabulous. I'm definitely going to make these—as soon as it cools off enough to run the oven! After a string of days so beautiful I hated to leave Wisconsin, we headed to a Seattle heat wave. Now I'm back home and the heat wave has struck here. I think I'll stick to foods not requiring much heat. But if your weather is pleasant or you have air conditioning, try these green beans. It's a simple dish with great taste. I planted scarlet runner beans this year because I wanted the beautiful flowers to make the garden prettier. Well, they do look great and taste great but they are infested with Japanese beetles. Ugh. The beetles seem to prefer the foliage, which leaves the tender pods for me, but I find the beetles creepy. When I was a child living in Philadelphia, we always had a large population of Japanese beetles every summer. One of our neighbors, who had lots of roses, used to pay the neighborhood kids to pick the beetles off his bushes. He told us his wife made them into "beetle cookies," and while I didn't quite believe him, part of me wasn't sure. He always gave us a certain kind of flat raisin cookie after each picking session that he said were his wife's beetle cookies. I remember years later, as an adult, I came upon these cookies in a store and was shocked to discover they were packaged cookies, not homemade. I think we should be more honest with children, or at least make sure they know when we're joking. The beans Aaron likes to use for this dish are the long skinny ones. 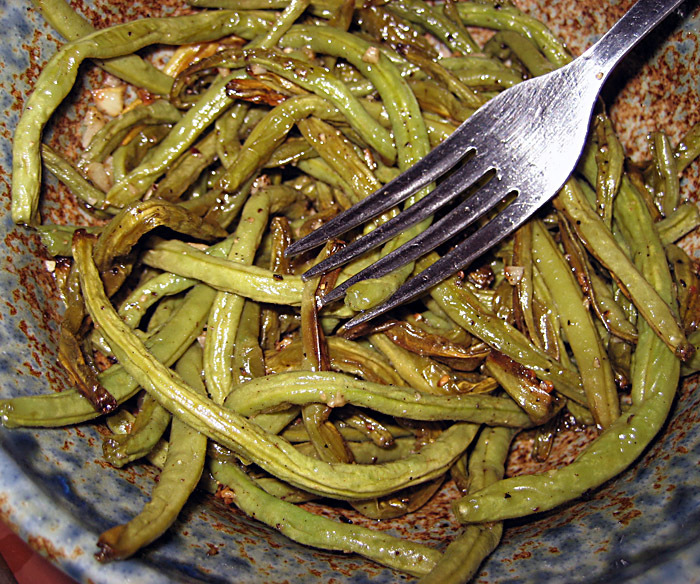 Toss a pound of long, skinny green beans, washed and with stem end removed, with one to two tablespoons of olive oil and salt and pepper to taste. Place the beans in a cast iron skillet and roast in the oven until shrivelled and cooked. This takes about 30 minutes. Halfway through cooking, stir the beans. A few minutes before they are done, stir in a clove of minced garlic. The beans will be crisp-cooked and brown in spots when done. Yes to the parsnip. I know they all shrivel and I don't mind, but the green beans really did look weirder than most. My favorite is roasted celeriac. It's the best. You can thank Aaron for these. We're getting green beans from our CSA tomorrow and I'm going to make them too! Okay, I know you posted this recipe over a year ago, but I wanted to thank you just the same. I prepared the beans exactly as you suggested, but topped them off with freshly grated parmesan just before serving. They were incredible! Thanks for writing. I love hearing that people have tried the recipes no matter how long ago they were published!